It's back to school shopping time! One of the things I put off until as close to the beginning of the new school year as I can is the shoe shopping. Drew has about 13 pairs of shoes, but bring in a single new pair and that's all she wants to wear. And by wear, I kind of mean wear out. Since her feet grow so fast, I am hesitant to purchase shoes that are super pricey, but buying the less pricey shoes means I am usually sacrificing durability. Note to all shoe manufacturers: If you are going to make children's shoes, no matter what price you decide to sell them for, you need to make them out of the most durable kid tested material. Put the prototype through the most rigorous testing you can imagine and then send them home with a child to really put them to the ultimate test! Thankfully, there are some really great shoe manufacturers out there, and we got to work with one recently. We connected with Bobbi-Toads, a company that makes fun, fashionable, and unique sneakers for girls. The shoes have "toes" that you can paint and re-paint with Bobbi-Polish or another non-toxic polish. These shoes are great for girls who want to add a little creative touch to their outfits, or who are like Drew and want to add a little extra flair to their look because they are required to wear a school uniform (just remember to be sure and check your child's school dress code to make sure specific shoes are not required as a part of their school uniform). There are 6 shoe styles available (3 with laces and 3 with velcro) and are available in sizes 11-6. Drew selected the 'Hillary' sneakers and we were sent 'Fashion Fuchsia' and 'Sweet Frosty Grape' Bobbi-Polishes that match the shoe so wonderfully. Drew knew instantly that she wanted to do an alternating pink and purple pattern on the "toes" and was excited to get to work. Mom was pretty excited to, but for slightly different reasons. These shoes are strong and seem like they will last a while (YAY!). They are also true to size, we ordered a size 1 and they are just a little big (she usually wears a 13 1/2). She LOVES Her New Shoes! 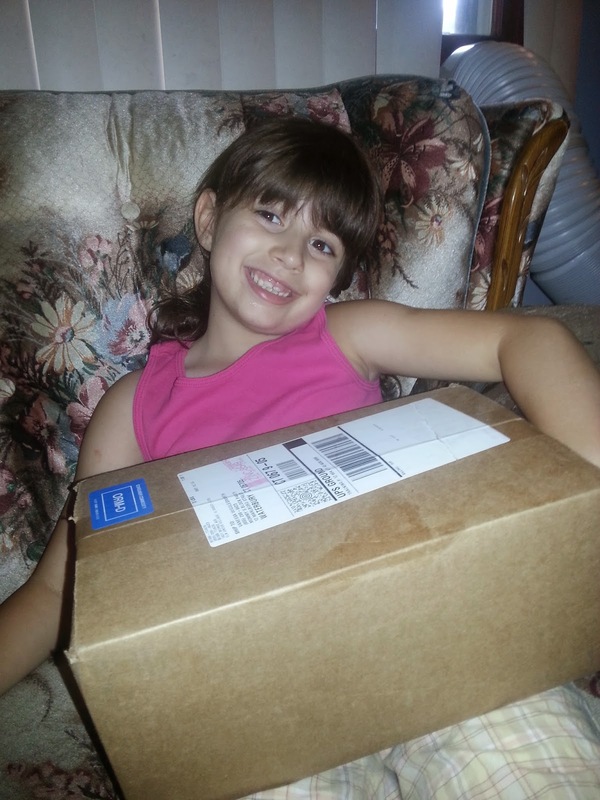 One Happy Little Princess with Her Treasures! Giving Her Bobbi-Toads a Pedicure! 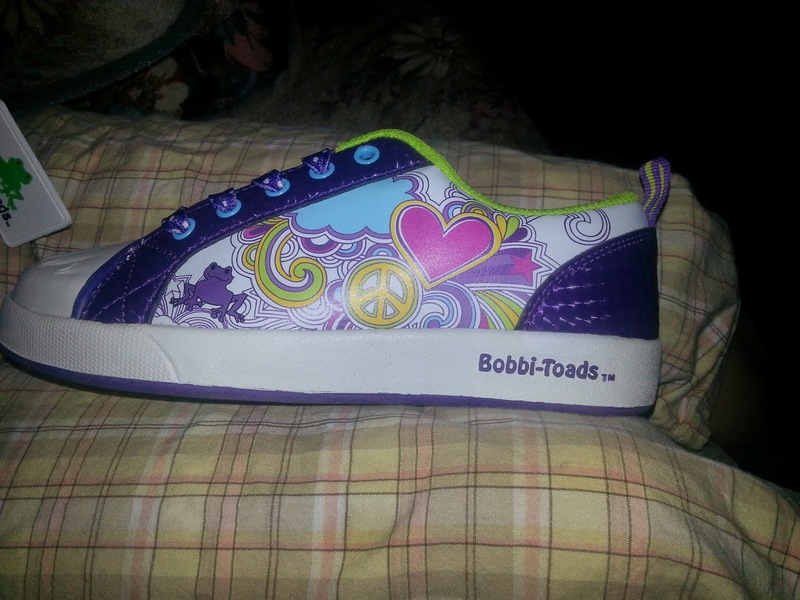 Bobbi-Toads Shoes are adorable and original, but more than that they are affordable and durable. If you are looking at shoes for your daughter for back to school, or any time of the year, you won't regret opting for Bobbi-Toads. You can order the shoes, Bobbi-polish and polish remover, and gift cards on the Bobbi-Toads website. You can also check their Store Locator for a list of stores that carry Bobbi-Toads products. Don't forget to connect with Bobbi-Toads on Facebook, Twitter, and Pinterest. 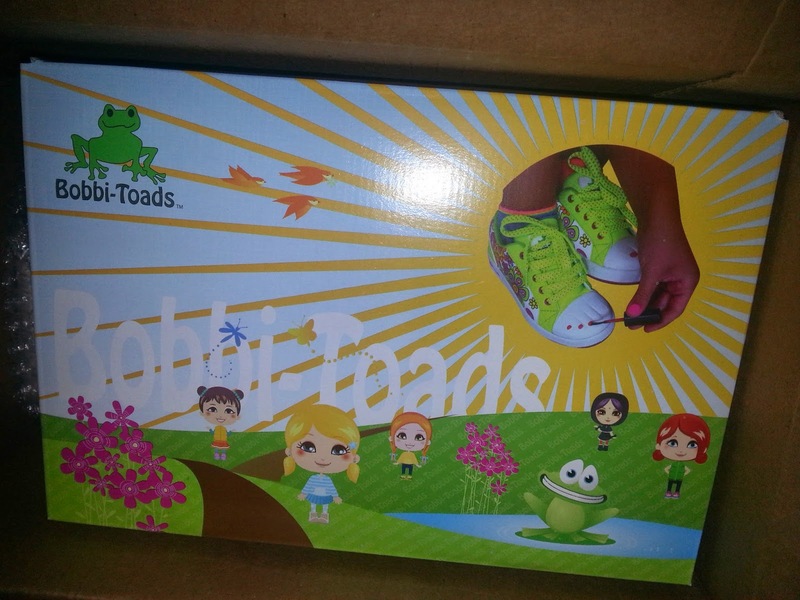 One lucky MBP reader will win a pair of Bobbi-Toads Shoes, just in time for back to school! Just use the handy dandy Rafflecopter entry form below to enter for your chance to win! Giveaway is open to US residents, 18 and older. A special thank you to Jacki Rae, Co-Founder and Marketing Director of Bobbi-Toads, for giving us the opportunity to introduce our readers to your wonderful product! We LOVE Bobbi-Toads! Tough choice..but I love the Sophie shoes. My Grandtot loves anything with flowers on it. I'd like to win Sasha. My BFF's daughter would love the flowers on the shoes. I like the Rhonda Kaze style. I think the glitter would be appealing to a little girl. 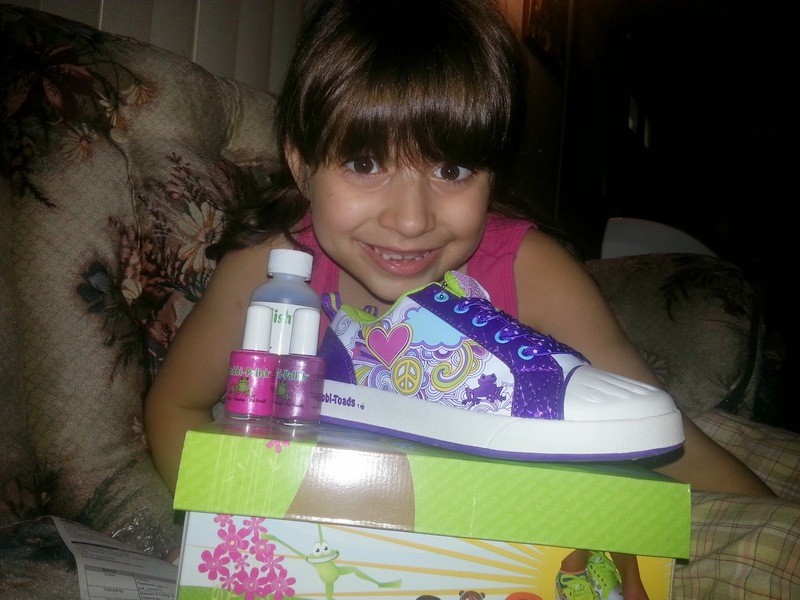 I would want to Rhonda Kaze shoes for my daughter. My daughter's favorite would be the Sasha. She loves green! I would the Rhonda Kaze for my daughter. My daughter likes to already draw on her pants (make them look neat - she says) but I don't like it. She would love that she could use the nail polish on the shoes - and mom would not get upset! 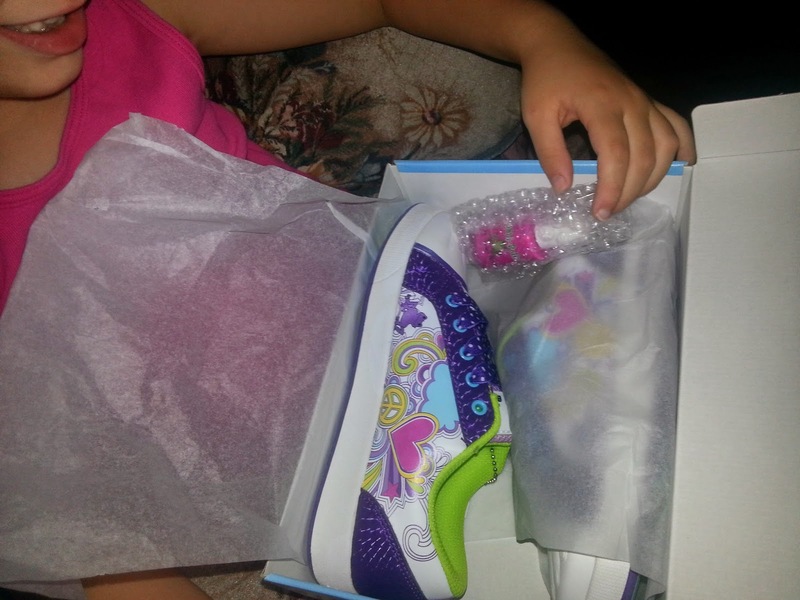 My Grand-daughter loves to "collect" shoes. She will try on different shoes throughout the day.